Are you thinking about moving to Bridgnorth? Let us guide you with some reasons to choose this town when moving home. 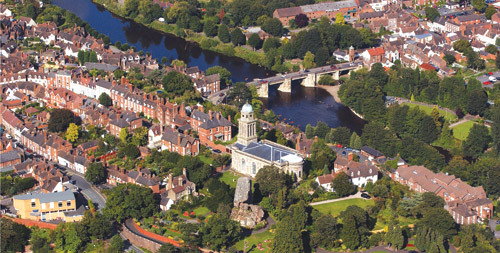 Bridgnorth is a large and historic market town in Shropshire, which sits on the banks of the meandering River Severn. The town is split in to two, High Town which is up on the hill and has amazing views, and the Low Town which are connected by England’s only remaining inland electric funicular railway at an incline of 33 degrees it makes it the steepest in the UK too. The town is also next to the famous Severn Valley Railway, which the Bridgnorth Railway Station runs on the heritage line and travels to Kidderminster several times a day. In other terms of transport, in the car it is only a 45 minute drive into central Birmingham, a 30 minute drive to Wolverhampton, 15 minute drive to Telford and 30 minutes to the M5. There are several primary schools including St John’s Catholic and Castlefields which have both received good reports from Ofsted. There are also two Secondary schools Bridgnorth Endowed and Oldbury Wells for your children to attend. However, given its slight isolation due to being a countryside town job opportunities for young people aren’t amazing locally, but there are plenty of opportunities nearby if you have access to your own transport. You will need to consider property prices if wish to buy or rent in Bridgnorth. The best places to buy properties lies in the West, on and off the Ludlow Road. However, many of the winding lanes have some lovely houses and historic cottages with heaps of character. The average house price paid in Bridgnorth for semi-detached properties was £184,715 and detached properties averaged selling price was £274,484. There is an abundance of places to eat and drink ranging from picturesque country pubs to international cuisine and many shops and supermarkets in the local area. You may wish to visit Severn Valley Country Park, with nature trails, a visitor centre, cafe and events throughout the year. For those are more physical recreation you may wish to visit Sun Valley Canoeing which specialises in Canadian style canoe trips for families, office parties and sports clubs whether novice or expert. Burke Bros Moving Group have a longstanding reputation as a respected domestic and international moving company. We have over 30 years’ experience in the moving industry and as members of the BAR, offer a professional service throughout. If you are looking to move home or need move to Bridgnorth, why not give us a call on 0800 413 256.